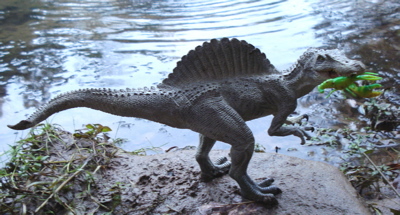 The Papo Spinosaurus is one of the most versatile Dinosaur toys. You like this? 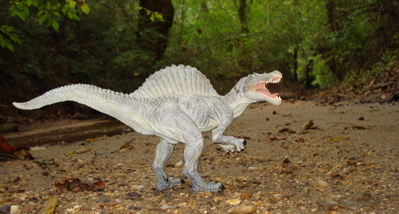 Buy your own Papo Spinosaurus at Amazon by clicking here^. 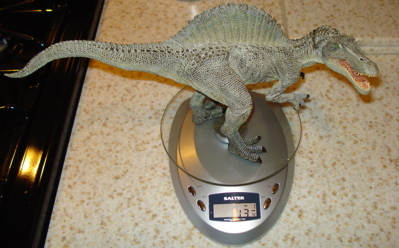 Weighing in at 13 & one-quarter ounces (13.25 oz) and measuring fourteen & three-quarter (14.75") inches from snout to tail-tip (not including the "sail") this is quite a large toy dinosaur. 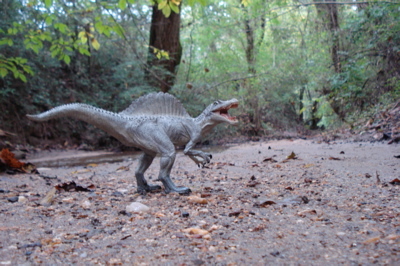 Given that real ones were upward of sixty-feet long this would be ~1/48 in scale, give or take.... 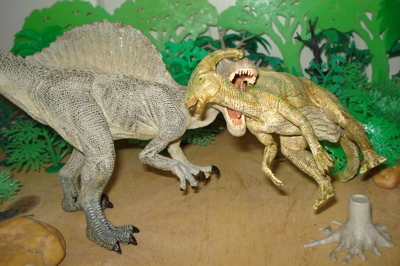 It also has a broader head and shorter/smaller "sail" than the Carnegie Spinosaurus, its closest toy-rival. 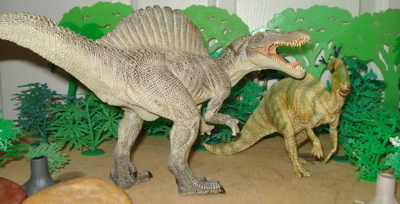 It is, as are most of the Papo Dinosaur toys, based upon the Dinosaurs in the Jurassic Park movies. 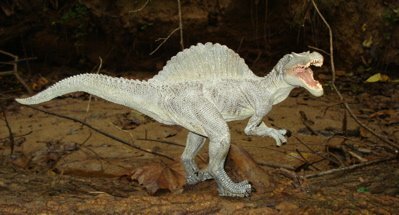 I think that the Papo Spinosaurus was designed to have "movie star" looks. And it pretty well does. 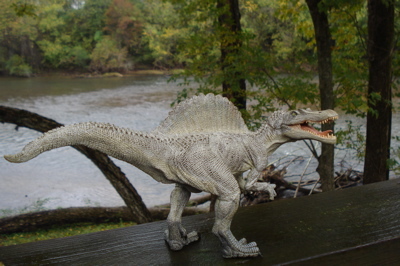 Made of a heavy 'rubber' this guy will not float off in a gentle current when searching in the local stream for food. 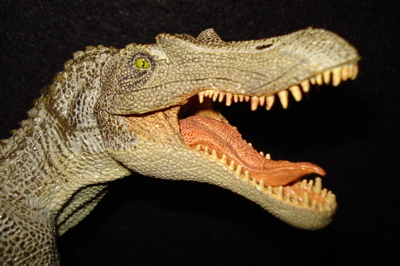 with that wonderful, innovative lower jaw that opens and closes showing the marvelously detailed interior (teeth, tongue and palet) to the detailed foreclaws show the care that went into this Dinosaur toys creation. 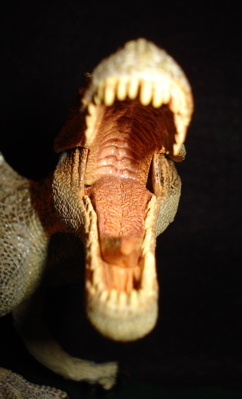 I do not ordinarily like toys that do too much, with movable parts that can break off, but this jaw does just enough and despite a lot of manipulation appears quite hardy for lots of play. 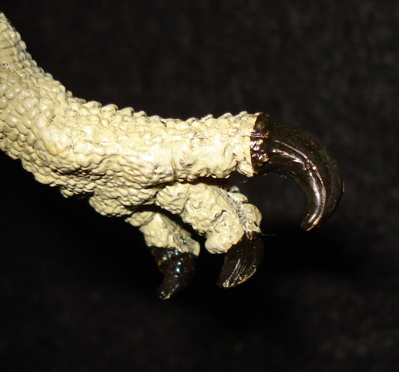 Can it be ripped off (by a child)? Yes, it can. Will it be pulled off in normal play? Unlikely. This is a good buy on all accounts. 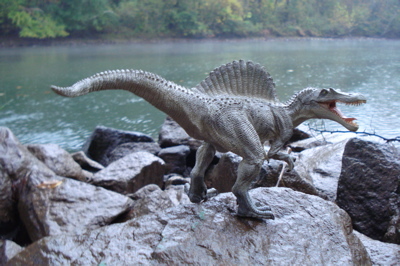 It is currently selling for $17-$24.00 a pop, retail, wherever quality Dinosaur toys are sold. 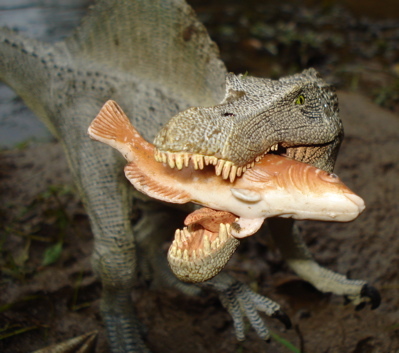 Heading down to the stream to do some fishing the Papo Spinosaurus is really quite good at what he does, which is to catch fish and whatever else he may like to eat. 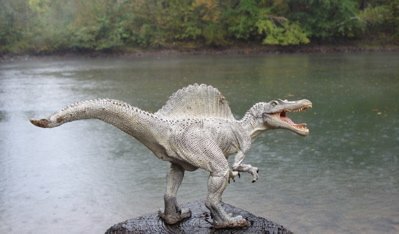 All in all the Papo Spinosaurus may not be the best Spinosaurus for younger children among the available Dinosaur toys out today. For an older or marginally more mature child (including adults like me) it is near perfect and comes highly recommended. 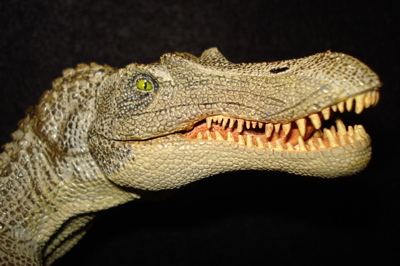 I would like to thank Hotaling Imports of Wampsville, New York for their help in making many of my Papo Dinosaur toys pages and recommend them as a resource for finding a retailer near you. 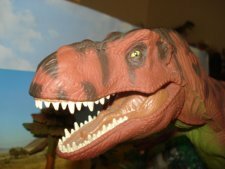 There are, of course, many other manufacturers in the business of making Dinosaur toys and you can find out about them here, along with all the wonderful Dinosaur toys they make. 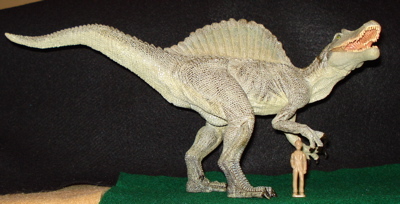 You've seen this in action and now you have to have a Papo Spinosaurus of your very own. You can get one from Amazon by clicking here.